Regular patterns of morphological variation with abiotic factors (especially temperature) have been observed repeatedly over time and space. These 'ecogeographic' gradients often involve body size, although coloration or dimensions can be influenced as well. The existence of ecogeographic patterns across space demonstrates the ability of species to adapt to fluctuating abiotic conditions, as well as underscoring the strong selection imposed on organisms by their environment. 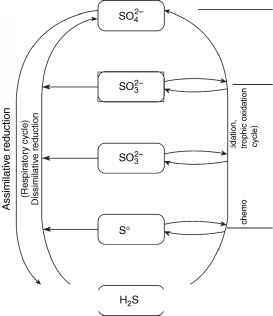 Figure 4 Percent of various vertebrate groups that conform to Bergmann's rule. Although endothermic vertebrates demonstrate a strong body size-cline with temperature, ectotherms are much more variable in their adherence to the rule. Drawn with permission from Millien V, Lyons SK, Olson L, Smith FA, Wilson AB, and Yom-Tov Y (2006) Ecotypic variation in the context of global climate change: Revisiting the rules. Ecology Letters 9: 853-869.
turtles). The most notable exceptions include lizards and snakes. There may be a tendency for larger-bodied animals to conform to the rule more closely than smaller bodied animals, perhaps reflecting a reduced ability to avoid stressful environments by burrowing or other means. In addition to being a general pattern across space, Bergmann's rule has been observed in populations over historical and evolutionary time when exposed to varying thermal regimes (Figure 5). Environmental temperature directly influences the energetic relationships and physiology of animals. Figure 5 Third-order regression equations fitted to data for woodrat body size and environmental temperature over the Late Quaternary illustrating adherence to Bergmann's rule over evolutionary time. (a) Mean body size of woodrats from various locations across the southwestern United States plotted as a function of radiocarbon date and expressed relative to the size of the animals at the same sites today. (b) Simulated July temperature anomalies from the National Center for Atmospheric Research Climate Circulation Model (NCAR-CCMO) expressed as deviations from modern temperature. (c) Mean annual temperature as estimated from deuterium isotope ratios measured in fossil leaves. All regression equations were constrained to yield contemporary values (as indicated by the dotted line in each panel) at 0 years BP. Drawn with permission from Smith FA, Betancourt JL, and Brown JH (1995) Evolution of body size in the woodrat over the past 25 000 years of climate change. Science 270: 2012-2014. Consequently, Bergmann's rule is often interpreted as a direct response to temperature. As organisms increase in body size, surface area increases more slowly than does volume (surface area a length2, vs. volume a length3), such that SA scales as ^V2/3. Because heat loss is proportional to surface area, this means that larger animals lose less heat per unit mass than smaller animals and are at an advantage under cold environmental conditions. Conversely, smaller animals have a greater surface to volume ratio and are more capable of dissipating heat under thermally stressful conditions. Numerous other mechanisms have also been postulated to explain the size-cline, including productivity gradients, selection on life-history characteristics, development rates, and other factors related to thermal characteristics of the environment. Although the validity of the rule is generally accepted, no general consensus has yet been reached about the underlying mechanism(s) generating the gradient in size. 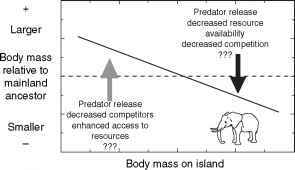 The island rule, or Foster's rule, is the general principle that larger vertebrates isolated on islands tend to become smaller, and small ones tend to become larger. It was originally proposed by J. Bristol Foster in 1964 in an analysis of islands of the coast of western North America and Europe. Over the past few decades, considerable research has gone into establishing the fundamental patterns and proposing a variety of underlying casual mechanisms. The island rule has been amply demonstrated for many groups of mammals and reptiles, although whether mammalian carnivores conform to this pattern is still unclear. The fossil record is replete with examples of both gigantism and dwarfism on islands: during the Pleistocene the Mediterranean islands contained numerous pygmy species of elephants, rhinos, deer, as well as giant rabbits, shrews, and mice. Pygmy mammoths occupied the Channel Islands off the California coast and giant hutias ranged on islands in West Indies, with one species reaching masses of 50-200 kg. Giant birds related to the pigeon were found on Fiji and the Mascarenes, and giant tortoises ranged on numerous islands in the Indian Ocean. Many of these large animals have subsequently gone extinct, in large part due to human exploitation. Figure 6 Schematic of body size changes in insular habitats leading to dwarfing or gigantism. Some of the selective forces postulated to be important factors in insular habitats are indicated; these may or not apply (and depending on the taxa may select for or against larger body size). These are not meant to be inclusive list. The magnitude of evolutionary shifts is known to be dependent on the size of the island and on the degree of isolation. dwarfing or gigantism may be related to the reduction in overall species diversity as well as resource availability. Note that the distinctive selective pressures on islands have also resulted in other major evolutionary transformations, such as the tendency for a loss of flight in birds, and reductions in the dispersal ability of plants. Cope's rule is an avowed tendency for lineages of organisms to become larger over evolutionary or geologic time. Named for Edward Drinker Cope, a prominent paleontologist who first proposed it in 1896, it remains unclear whether it is a valid phenomenon or an artifact of sampling or investigator biases. Studies of several vertebrate groups such as mammals and dinosaurs appear to have generally upheld the tendency for descendent lineages to be larger than ancestral ones. Other studies, including those of marine organisms have not. Moreover, no clear underlying causal mechanism has yet been accepted to explain why an evolutionary trend toward larger body size should be favored over geologic time. Larger body size can increase the fitness of an organism if it results in a net increase in the ability to acquire resources and energy from the environment. Several traits such as foraging ability, predator avoidance, reproductive success, and thermal efficiency may be positively related to larger size. Although the fitness of the individual may increase with size, there are considerable disadvantages to large body size at the population, species, or clade level. Significant among these is that longer generation times and lowered population densities concomitant with large size might render organisms more susceptible to environmental perturbations and/or extinction events. Because body size so strongly constrains the energetic demands of organisms and their interaction with the environment, it is not surprising that it also influences space and home range requirements, population densities, and other important population and community level characteristics. The statistical study of broad, consistent patterns between organisms and their environment is called macroecology, a term coined by James Brown and Brian Maurer in 1989. For example, the population density of mammals scales negatively with body mass, with about the same exponent, as does the positive scaling of metabolic rate. The coupling of these relationships results in a well-known macroecological pattern dubbed the 'energetic equivalence rule', which suggests that the energy used by a local population of a species in a community is largely independent of its body size. Similar allometric relationships have been observed between abundance and body size for other groups including algae, terrestrial plants, and marine phytoplankton. Evidence from recent research suggests that there may well be general mechanisms that link the metabolism of individuals to higher-order emergent properties of communities and ecosystems. Thus, the study of body size is likely to continue to be a fruitful area of research in years to come.